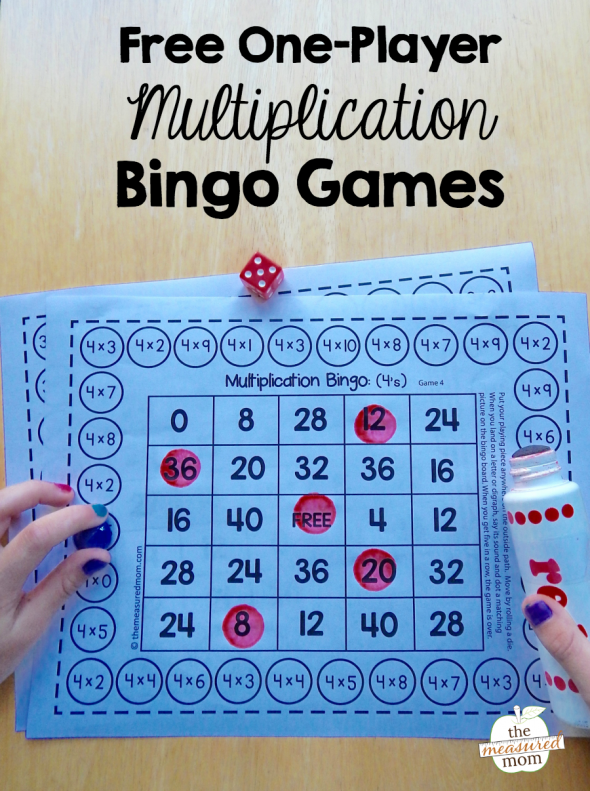 Today I’m sharing a set of free multiplication bingo games – perfect for practicing those tricky facts! Our oldest just began fourth grade and is required to practice her multiplication flash cards five times a week. After a week, she already knew her facts. But we’re still asked to practice them. I don’t know about you, but doing flash cards with a child who already knows her facts – every night – makes me crazy. So I’m on a mission to create a series of fun multiplication games. That way we can fulfill her assignment without getting bored! And as a bonus, your kids can enjoy the games too. The final three games include mixed facts. To play, grab a Do-a-dot marker (or regular marker), playing piece, and die. Have your child put her playing piece anywhere on the perimeter of the board. Have her roll the die and move around the board. When she lands on a fact, she finds the answer in the middle and dots it (or X’s or colors it, if you don’t have Do-a-Dot markers). When she gets five in a row, she’s done practicing. 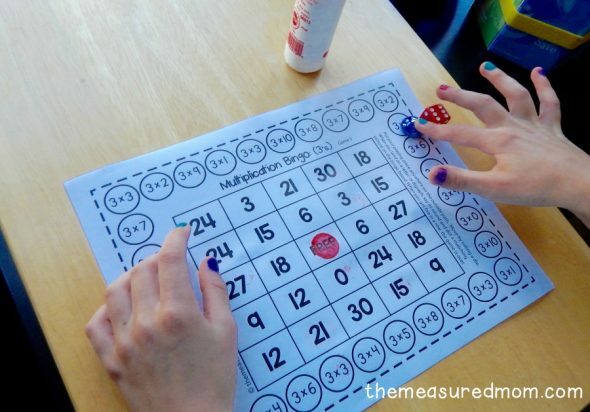 Stay tuned for more multiplication activities… grab this one today! 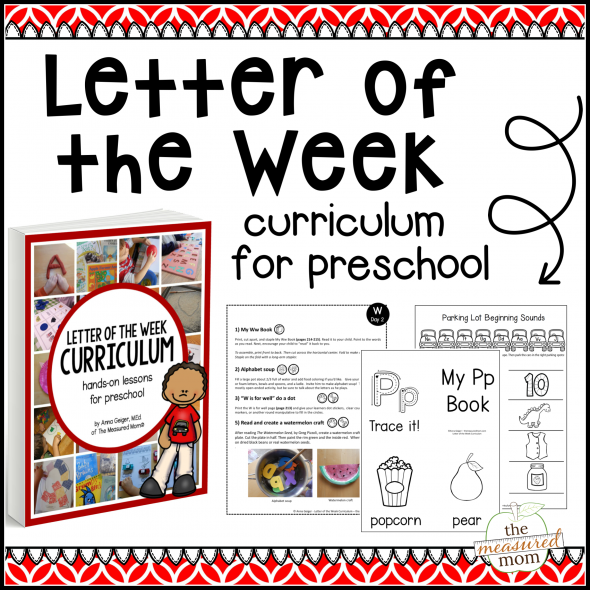 Have you seen the rest of our freebies? Hi, this is great! My son is in fourth too. Can’t wait to try them. I did notice on the playing board with the instruction it mentions letters/diagraphs. Thank you for being so creative. 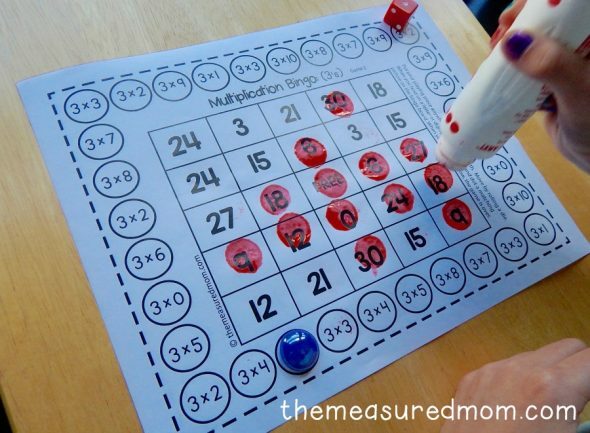 This multiplication game is just perfect for reviewing the time tables and lots of fun for the kids. My son just loves them. I’m so glad to hear that, Barbara! Thanks a lot! My guys just need to revise multiplication. I’m so glad you can use them, Alayna – thank you for the comment! Just print the games, Kati, and you’ll find the instructions printed right on them! Do you happen to have these for the other operations? I wanted to check before I attempted to make my own! 🙂 Great for centers work! Fantastic ! I think you are not only thoughtful and talented but generous too. I am teaching multiplication tables and you are right doing the multiplication cards bores them after a while. I have done mixed facts speed maths and simple division to check if they understand that multiplication is the reverse of division(sharing). This is great because now I have one more way to check their understanding of the topic. I will use it this week during Maths group activities. The only password for my site is the same for all subscribers. You’ll find it at the end of your most recent newsletter. Thanks for these bingo games. We recently moved and my son won’t be starting school til September. 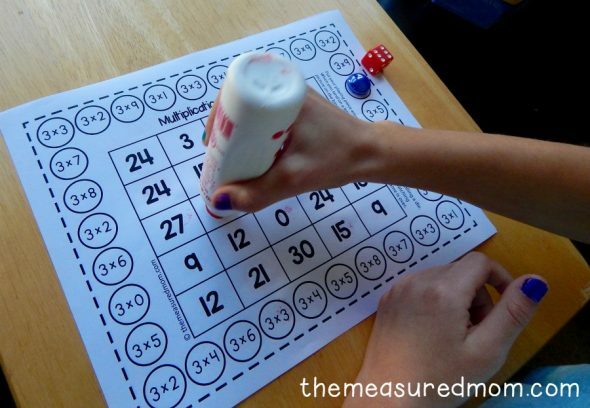 These are great to keep multiplication interesting and fresh. Thank you so much for these bingo cards. I am a third grade teacher and these will be perfect for center work. Fun way to review/practice facts! What a novel idea! I love the fact that it can be practised as an independent activity. A great way to end the drudgery of learning the tables. Thank you so much!! Thank you for sharing. We will use them when we have a few minutes “spare time”. I hope they are a success! I think I will laminate them and use dry erase markers. Thank you so much. I have homeschooled for 26 years. This game is so well done. I printed to use with my 4th grader. My 1st grader didn’t want to be left out. I handed her a hundreds chart and she has now learned her 2’s and 3’s. I did not have the chance to plan when to use them. They were whipped off the printer and the children began playing. I put the sheets in page protectors and they use dry erase markers. I would love to see a set with 11’s and 12’s as well as a set for addition. I can put that on my “to make” list, but it might be a little while … 🙂 Make sure you’re on the subscriber list so you’ll get notified when I make an update! I enjouy your site very much. I printed your “multiplication facts” practice sheets. It seems like I misplaced them. I’m sorry, I don’t have any facts practice worksheets on my site.